My literary horror sort of gothic novel 100 Years of Blood and the collection SEVER, SLICE and STAB: 20 Tales of Horror are both now available in print. This time I decided to go for something different with the designs. I intentionally decided to go against much of the common wisdom about e-book covers, and instead focused upon the print copies. I still think the top one should look okay as a copy for an e-book ... okay, not great, but okay ... but the bottom one doesn't show up will in the digital form, though I think it looks pretty nifty in the printed edition. Where do I see myself as a fantasy writer? One might argue a writer cannot determine his or her own legacy, not unless that writer becomes quite popular and lives to a ripe old age. Speculative genre figures such as Heinlein and Asimov and Tolkien had some control over how they were portrayed, but the images they had of themselves change and evolve the further we get from the end of their writing careers and often their deaths. I am in no position to even think about my own writing legacy. Or at least I shouldn't be. I'm not that popular an author, in fantasy or any other genre. But I don't set out to be. Fame isn't a goal of mine. More money is always appreciated, but that's not really my goal, either. Telling stories? A good number of writers will suggest they live to tell stories, that they long to reach readers with their tales. This is closer to the truth for me, but it's still not hitting the nail on the head. I don't write for readers, at least not initially with each novel or short story. I occasionally will write with an anthology editor in mind, but that's usually because they have provided me a challenge in some way by giving me a new world to play in or a twist on a genre which I find interesting. So who do I write for? I don't write because I enjoy it. Sometimes I do, sometimes I don't. I write because, when I'm truly honest with myself, there are people living in my head and they are yearning to get out. They live there, slurking around within my skull, having their adventures, slaying the monsters, falling in love, falling out of love, betraying one another, honoring one another, doing all kinds of things to themselves and to each other. No. No, that's not quite accurate either. These people do not live in my brain. They live outside of me in another universe, or perhaps several other universes. If you're up on your quantum physics, this is theoretically possible. So, they live in these other worlds, and my brain is somehow a conduit to wherever they are located. My mind is filled with images and emotions, and I must get these down onto paper or onto a computer screen. I must. I have to. It's like breathing, or eating, or drinking water. If I do not do this, I will cease to exist, at least in any meaningful, conscious way. Without writing, I could physically go on, but I would be a shell of my former self. Also, writing is sort of a spiritual thing for me, not quite metaphysical, but more philosophical. I like to explore my own mental landscape through my writing, and sometimes that is exciting, other times not so much. If I don't tap into the stories in my head from time to time, my head will fill up and eventually explode. And we can't have that, brain matter and bloody gore all over the place with a bunch of sword-swinging freaks and ghoulish beasties wandering about outside my corpse. That would be bad form. So I write. I let a little steam out of the boiler from time to time. Now back to the image of myself as a writer. I don't really set out to have an image, to be honest, though I suppose I do have one or something like one. For example, a fan recently called me "humble," and I had to think about that. Am I humble? I don't consider myself especially humble, but when I look around at the world in which we live today, yeah, I have to say I'm a pretty humble guy. But only comparatively. I'm not as humble as a saint, not by any means, but compared to the celebrities and politicians and other familiar names in the headlines, yep, I'd say I come off as pretty humble compared to them. If I get remembered as the "humble" fantasy writer, there are worse things. If I'm remembered at all. Not overly worried about being remembered or not remembered, honestly. But if I am to be recalled by future generations as a fantasy author, how would I want myself to be remembered? As an esteemed professor, such as Tolkien? As the hard party boy, like Karl Edward Wagner? As a hard working writer, such as Glen Cook? I suppose that last is closer to the truth. See, I never set out to become some world-known fantasy author. I've never had any plans to go down in history as some literary genius, either. Back in my youth I had plans to become a horror author, but I eventually found that limiting, though I still work some in that genre. If I had to pick and choose, I suppose I would want my fantasy writing career to be more akin to that of many of the '60s to early '80s fantasy authors, most of whom are not remembered today outside of true fandom. Zelazny, Norton, Saberhagen, these are just a few of the names. These writers weren't necessarily the greatest writers who ever lived, at least in a literary sense, but they could type out adventure tales not unlike the pulps of an earlier era. Michael Moorcock came out of that group, and today is probably the best known of the lot. I'd like to add that I don't mean any of these authors are completely forgotten, but that they aren't generally recalled or even known by the world's mass consumer audience. Much like the pulp writers of the '20s through the '50s. I suppose that means I would be satisfied being thought of as a modern pulp author, for being remembered as such. I'd like to be remembered for bringing the thrill of adventure or the creeps of horror to a few readers, to bring a smile or smirk or gasp to their lips from time to time. All while keeping my brain from exploding. If you want to see me rant and rave today about writing, you'll have to check out my guest post over at the blog of horror writer Kevin G. Bufton. when up rode a man in plate. and a look that was filled with hate. I hear your cantrips are great. I was shaking like an imp in Hades. sporting in all those blades. I can’t even summon up dew. Gimme three spells and not one more. for anyone to save my hide. To that armored man being denied. And that’s the chance I was seeking out. I’d never come back there, no doubt. The headline to this post says it all. I've not published a lot this year. Serious health problems have hit my family pretty hard since January. My book sales are evidence of this. There were weeks on end, maybe even a month or two, in which I did not write a word. Nothing. Zip. Nada. I was just too busy, and often too emotionally devastated to write. The period seems to have moved passed, though it still lingers around the edges of my sanity, and I'm back to writing daily. Thinking about all this brought me around to realize that I've accomplished more this year than I initially thought, though most of that work is not readily apparent to anyone. I did put out a five-part series of short stories very early this year, my Shieldbreaker tales. I also managed to get the majority of my self-published works into print form, though a few of those are still coming, a couple likely in the next week or two. On top of that, I helped a children's indie author with formatting her first book. And then there's my super secret collaboration with another author. I've felt guilty because I should have been able to punch out this project in a month or two. Last year I could have managed that. Not this year. Instead, I've pecked and picked and clicked and clacked at the keyboard off and on for about six months now. Finally the first draft of that project is nearing its end. The other author finished up his end of the writing a long while ago, but I'm just now down to the last couple of scenes. I hope to have my first draft finished within a week or two, then I'll start reading it and making corrections, doing some rewriting, etc. I've also managed to pen a few short stories this year. Three have been accepted in anthologies and will be available sometime in the next year, possibly one of them within the next month. I have another story finished and ready for the editor, but I've yet to submit as it's still a little early for that. So, looking back, I got more accomplished this year than I originally believed. With a few months left in the year, perhaps I'll even get another novel finished, or at least near finished. Come January, it will have been two years since my last Kron Darkbow novel. That's at least a year too long, in my opinion, but hopefully I can remedy that situation soon. I have recently joined all the cool kids and have taken part in the new Smashwords interview process in which indie authors answer questions provided by the Smashwords site or questions the authors themselves come up with. I went with the site's questions, as creating my own questions doesn't feel like an interview to me, but that's just me. Notes: As the title suggests, this is actually a collection of two of Thoreau's books, Walden and Civil Disobedience. I've had this book for some time, but kept putting it off because I wanted to be in the right frame of mind to study it and hopefully to enjoy it. The famous Walden is about the author's two years living alone in the woods near a pond, and Civil Disobedience was originally a speech given by Thoreau concerning the duties of American citizens. Individualism, to some extent libertarianism, transcendentalism, simplicity of living, and other factors are discussed in this literature. Mini review: I went back and forth on this book. Some of it I found quite interesting, other parts not so much. Roughly the first half of Walden tends to focus upon philosophy, which to a modern eye is a sort of naturalist libertarianism. While I personally agreed with some of this and didn't agree with other parts of it, I still found it interesting, especially as it's a work of philosophy somewhat grounded in what I think of as "reality," and is not a philosophical work that goes off on tangents of logic so complicated as to almost be high mathematics (writers of empiricism especially come to mind ... John Locke, David Hume, etc., but also some of the rationalists like Leibniz and Descartes). 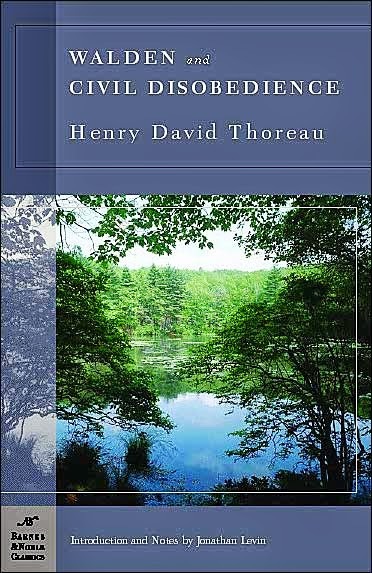 The second half of Walden mostly focused upon Thoreau's various observations of nature around his cabin and at Walden Pond. This section of the book did not thrill me. Having lived a sizable portion of my life in or around rural districts, I'm well aware of what a pond looks like, the animals and plants found in such regions, the effects of the seasons upon such regions, etc. While there might have been some subjects of Thoreau's study specific to the Walden Pond region in the mid-19th Century, most of it was readily familiar. However, in this portion of Walden there were also some historical writings about particular individuals, a number of them slaves or former slaves, who lived in the area, and this I found of interest. The last chapter of Walden returns to the more philosophical writings, and this I enjoyed. As for Civil Disobedience, it is only about 20 pages, being a speech the author gave publicly on a few occasions. The reason for the speech is that Thoreau was once arrested and jailed for not paying a poll tax, which he did out of protest against slavery and the U.S. war with Mexico. Civil Disobedience itself does not focus on that event but it does allude to it, and it goes on into a philosophy that borders on anarchy while also retaining much concerning the U.S. Founding Fathers. Civil Disobedience I found interesting from historical, philosophical, and even political points of view. Thoreau calls for recognition of the importance of the individual within broader society. Not that an individual is necessarily more just than a collection of men, but that the collection isn't itself more just simply because of numbers. And Thoreau consider it the individual's duty to not take part in government of which he or she does not morally approve, even to the point of imprisonment and confiscation of goods. On the other hand, Thoreau suggests the best way to never be in any one government's power is to live simply, to never own enough of anything so that it hurts one when those belongings are taken away. "The standing army is only an arm of the standing government." "But a government in which the majority rule in all cases cannot be based on justice ..."
"He who gives himself entirely to his fellow-men appears to them useless and selfish; but he who gives himself partially to them is pronounced a benefactor and philanthropist." "There is but little virtue in the action of masses of men." "Under a government which imprisons any unjustly, the true place for a just man is also a prison." "But the rich man ... is always sold to the institution which makes him rich." "Is a democracy, such as we know it, the last improvement possible in government?" "The heroic books, even if printed in the character of our mother tongue, will always be in a language dead to degenerate times ..."
"But, wherever a man goes, men will pursue and paw him with their dirty institutions." "I am convinced, that if all men were to live as simply as I then did, thieving and robbery would be unknown. These take place only in communities where some have got more than is sufficient while others have not enough." "It is not all books that are as dull as their readers." "I never found the companion that was so companionable as solitude." "... instead of studying how to make it worth men's while to buy my baskets, I studied rather how to avoid the necessity of selling them. The life which men praise and regard as successful is but one kind. Why should we exaggerate any one kind at the expense of the others?" "We worship not the Graces, nor the Parcae, but Fashion. ... The head monkey at Paris puts on a traveller's cap, and all the monkeys in America do the same." "... men have become the tools of their tools." "We have built for this world a family mansion, and for the next a family tomb." "The cart before the horse is neither beautiful nor useful." "There is some of the same fitness in a man's building his own house that there is in a bird's building its own nest. Who knows but if men constructed their dwellings with their own hands, and provided food for themselves and families simply and honestly enough, the poetic faculty would be universally developed, as birds universally sing when they are so engaged? But alas! we do like cowbirds and cuckoos, which lay their eggs in nests which other birds have built ..."
"Our inventions are wont to be pretty toys, which distract our attention from serious things. They are but improved means to an unimproved end ..."
"As for the Pyramids (of Egypt), there is nothing to wonder at in them so much as the fact that so many men could be found degraded enough to spend their lives constructing a tomb for some ambitious booby, whom it would have been wiser and manlier to have drowned in the Nile, and then given his body to the dogs." "I have since learned that trade curses every thing it handles ..."
"But I would say to my fellows, once for all, As long as possible live free and uncommitted. It makes but little difference whether you are committed to a farm or the county jail." "To a philosopher all news, as it is called, is gossip, and they who edit and read it are old women over their tea." "The farmer can work alone in the field or the woods all day, hoeing or chopping, and not feel lonesome, because he is employed; but when he comes home at night he cannot sit down in a room alone, at the mercy of his thoughts, but must be where he can "see the folks," and recreate, and as he thinks remunerate, himself for his day's solitude; and hence he wonders how the student can sit alone in the house all night and most of the day without ennui and "the blues;" but he does not realize that the student, though in the house, is still at work in his field, and chopping in his woods, as the farmer in his ..."
"In a pleasant spring morning all men's sins are forgiven. Such a day is a truce to vice." "... as he simplifies his life, the laws of the universe will appear less complex, and solitude will not be solitude, nor poverty poverty, nor weakness weakness." "Most think that they are above being supported by the town; but it oftener happens that they are not above supporting themselves by dishonest means, which should be more disreputable." I've never told anyone this story. It's not that it's a secret or anything, but more that I never thought it was much of a big deal. Still, the memory hit me recently, so I thought I'd share since the Halloween season is just around the corner. Lo those many, many moons ago when I was an undergrad (1980s), I took part in a class on 19th Century literature. At the end of the semester, we students had to turn in something like a 20-page paper on the history behind a particular novel. At the time I thought 20 pages was a ton, as likely did most undergrads, but now I'd laugh and think, "Wow. 20 pages is nothing." Especially given the novel I was handed for my report. I've never been the biggest fan of the novel. I've read it a few times over the years, and I do enjoy it, but I don't gush over it like so many others I've known. 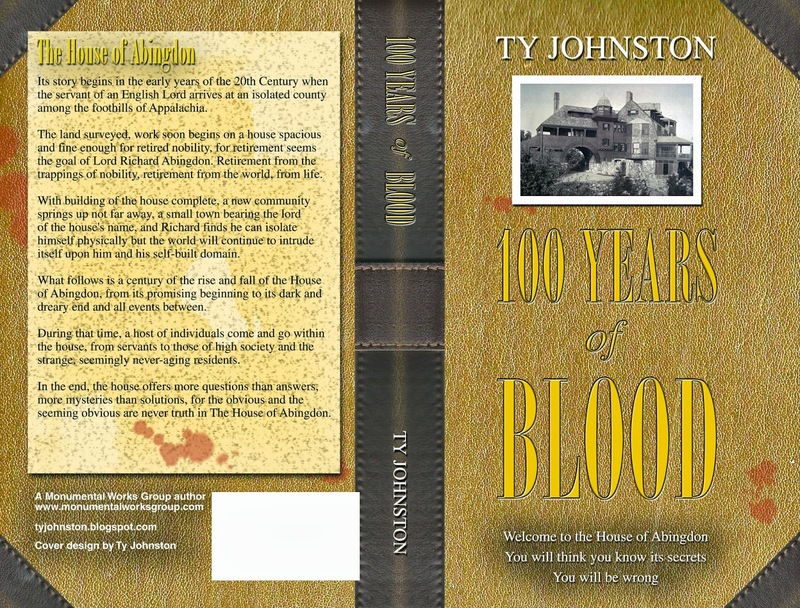 It was also fortunate for me to have landed Dracula because at the time I already knew a fair amount about the real-life history of vampirism. I was still in a phase in which I wanted to be a horror novelist, so I was somewhat well read in all things horror, the supernatural, the occult, etc. Keep in mind, this was in the days before the Internet. My knowledge had been gained almost entirely from books at that point. As time drew near for my paper to be due, I did like every other undergrad and waited until the last minute. Or near abouts. Maybe a week before the end of the semester, I decided it was time to get serious about this paper because it wouldn't write itself. I gathered and studied my personal books at home, the ones I thought would provide me with information and bibiliographical material, but I felt it wasn't enough. I wanted to go deeper, to study in detail the rise of the idea of vampirism. To that end, I made a trip to the main library in the city where I lived. It was in an old building even then, a building that now houses a historical museum. The aisles were tight, rooms were empty, and the lights didn't always work. It was a gloomy place, what one might think of as a spooky place. I always felt myself alone there. More than alone. It was like being stranded in a world made of nothing but books. There easily were hours that would go by without me seeing another living person unless I glanced out a window to the surrounding streets, and even those streets weren't near as the building was surrounded by a sizable yard. Anyway, I spent some time there doing my vampire research. And I came up with nothing. Yes, nothing. Available were very few books which had any indepth material, or at least there was no material I did not already have access to through my books at home. Disappointed, I decided to give my university's main library a try. It wasn't as old, but it was much larger than the city's library. There ... things got a little weird. Going through the library's card catalogues (remember, no Internet, very few computers), I was glad to find there were indeed more than a few books pertaining to my subject, some of these books apparently quite deep into the history of vampirism, especially during the Middle Ages. I broke out a trusty yellow pad and a pen and started up a list of all these books, along with the Dewey Decimal numbers to allow me to find the books. By the time I was finished, the first page of the pad was filled. I had something like 25 books to research, most of which I'd never heard of before. Great. That got me going. By the time I got a chance to begin my serious hunt for these books, and I wanted them all for my own purposes if not for the upcoming paper, night had spread its dark wings upon the campus. Placement of the first book was supposed to be on the third floor. I went up to find the book. It was not there. I shrugged it off, figuring the book had been checked out. I went on to the next book, which was supposed to have been on the floor above. It also was not available. I kept up my search. It took hours. Midnight was drawing near. And none of the 25 books were to be found. Especially considering these weren't mainstream reading materials. Some of the books were a century in age or older. I couldn't fathom that all of them had been checked out. A few of them, maybe even half of them, yes, I could accept that in the off chance some other student (there were 25,000 of us, after all) was also doing similar research. As closing time neared, I decided to head to the ground floor. My plan was to ask one of the librarian assistants to run a computer check for me to find out what had had happened to all these books. Hitting the stairwell in the oldest end of the building, I began to work my way down. I had started at the very top, the sixth floor, and kept plodding down and down and down. All the while, I never passed another living being, which was unusual. I shrugged it off due to the lateness of the hour. When I reached what was familiar to me as the ground floor, I tried the door. It was locked. Weird. I'd never known that door to be locked. Even odder was that the narrow vertical window in the door through which I usually could see the front room of the library, it was covered by some kind of paper or poster. And I could hear nothing beyond. Usually there would be the hustle and bustle of students, librarians and assistants, even at this late hour. But now? Nothing. Was my watch wrong and closing time had already come? Had the library's hours of operation changed without my noticing? Was I locked inside? By this time I was becoming somewhat frustrated. I had spent hours trying to do research and nothing had come of it. Now I was possibly locked inside the library. I considered climbing back up to the second floor to try the door there. Even if I was locked in the library, perhaps I could find an assistant working late or a security guard. If worse came to worse, perhaps I could find a phone to call the campus police and let them know about my situation. To this day, I'm not real sure why I didn't do that. It would have been the logical thing to do. Instead, I continued my way down the stairs. I knew there were lower levels to many of the major buildings on campus, including the library, but those basements were not my true goal. Most students at the time were not aware of it, but my university had an underground tunnel network that connected most of the major buildings on campus. The tunnels were mainly for employees to use, to quickly allow them to move from one spot to another without wading through the throngs of students that often filled the grounds. I happened to be aware of this tunnel system because being a journalism student and reporter and editor for my college newspaper, I had a few connections not readily available to most other students. I had even been down in the tunnels once, but that had been in another part of campus. The portion of the tunnels I had seen had been quite modern looking, mostly concrete block, clean and lit well. I suppose my thinking was that I would head down to the tunnels and try to find my way to another part of campus. But I really don't remember giving it any thought at all. I just headed down and down. At the first sub-level landing, I noticed the steps and the landings were not as clean as the levels above. There was grime and grit built up on the walls and at the sides of the steps. The flourescent lighting was dimmer, weaker, and there was even an old plastic bucket sitting in a corner with dirty, grayish water floating about within. Ah, well. Students and staff didn't come down here, so the custodial staff probably didn't care so much. There was a door on this level, metal and thick looking. It was locked, and there was no window through which to see. The next basement level was even dirtier and darker. The single flouresenct bulb flickered off and on. The walls were nearly black with grime.The door here was also locked, and grungy looking. On the third landing, I could barely see. The light here did not flicker, but it barely burned. You know when a flourscent bulb has nearly died and only glows a very light purplish color kind of like a blacklight hung over a '70s rock poster? Yeah, it was like that. Also, there was so much gunk on the floors that my steps were tacky, and I was afraid to touch the walls for fear of coming away with who knows what. But, thankfully, there was another door. Another big, thick, heavy metal door. I tried the cold, round handle. I gave a sigh of relief. But then I stopped. There was no light beyond the door. I only opened it a few inches, but I could see nothing inside but a flat blackness. And the chill. It felt like waves of cold were rolling from the room beyond. I remember having a jacket on, and I still shivered. The better part of valor gave me caution at that point, and I decided to close the door. Glancing around, I saw the stairs went even further down, but there was no light there. More blackness lay ahead of me if I continued along my path. Standing there, I felt a bit foolish. I told myself I wasn't going to go through a dark door into someplace with which I was not familiar, and I would be an idiot to go down a stairwell into darkness, but deep down there was more to it than that. I was beginning to feel as if I was caught up in something ... unusual. The search for the books. The eerie stairwell. The door that opened into a black darkness. It was kind of like something a Lovecraft character might experience, and I was well aware of Lovecraft even at my young age. I decided it was time to head back up the stairs, to try the door at the ground floor again, or perhaps to continue to higher levels in search of an open door or a person or a phone or anything. My way was not retarded. Nothing slowed me in the least, other than my growing fatigue at the lateness of the hour and all the walking and climbing I had been doing. It seemed to take forever, but eventually I reached the ground floor again. Oddly, the window in the door was no longer covered, and beyond I could see the familiar well-lit main room of the library, plenty of people floating around there and the sounds of their hustling and bustling coming to my ears. I was most gratified to find the door opened easily at my touch. By this time it was near one in the morning, and the library staff were preparing to close up for the night. Still, I had to finish my paper, and I wasn't giving up yet on my hunt for those books. I had a few minutes left, so why not make the best of them? I proceeded to a desk, one of those long and tall and wide and giant desks you see only in old libraries, and told the lady behind it of my general situation. She asked to see my list of 25 books, so I handed it over to her. She spent a couple of minutes tapping away at the keyboard to the computer in front of her, then frowned and called over a younger person, a guy about my own age and obviously a student. Apparently the older woman had felt her computer skills weren't up to the task, so she was seeking help. The newcomer tapped away for a couple of minutes himself, then he began frowning. Finally he looked up at me through his glasses. He seemed a little worried. "All of these books are missing." "Yes," was the response, with no qualifications. We stood there staring at one another for what felt like long seconds. Eventually, I asked, "Well, were they stolen or checked out?" "Yes," he said, which didn't exactly answer my question, "but none of them have been returned." The woman looked as if she should add something to the conversation, so she said, "They've been gone for at least a year. All of them were checked out within a matter of days of one another." Flummoxed, I still wouldn't surrender my quest. "Well, can't you see who checked out the books and contact them to return the books?" The guy glanced at the screen again, then back to me. "That's the thing, though, it doesn't say who checked them out?" He turned around the heavy computer monitor so I could see its glow of bright orange on black. Then he pointed to a digital row of the list of books I had been seeking, his finger coming to rest at a specific blank space next to one of the books. "Normally there's a name here telling us the person who checked out the book," he said. "But as you can see, there's nothing. And when I checked for the card number of the last person to rent the book, there was nothing there either. I've never seen this before." Both of them stared at me confused. At this point, I lost my cool a little. I didn't curse, but I do think I stomped a foot. Glancing around, I'm sure with frustration clear on my face, I said, "Man, I've spent hours in this place, and it's been a waste. I've climbed from the top of the building all the way down to the third sub-basement, and I've got nothing to show for it." They looked at one another, then looked back at me, their confusion all the greater. "But, sir," the guy said, "this building only has one basement level. It's the cafeteria." I stared back at him. "Can't be. I was just down there." The woman provided a grin and a "tch," then added, "Honey, I've worked here nearly 30 years. I can tell you, there's nothing below us but the cafeteria." It was then I remembered the library's cafeteria. I had only been down there once before, but I did remember it. I muttered something, thanking them while retrieving my written list of the 25 books, then shuffled my way out the door and into the winter night, which wasn't as cold as that chill I had felt coming from behind that basement door. Nothing more came of any of this. I finished my report with the books available to me at home. I seem to recall getting an "A." Now, it has been about 25 years since those events happened, so my mind might not be perfect about all the details. A while back I found that hand written list of 25 books on vampirism. It was stuffed into one of my old notebooks on Roman history (yes, I kept them, all six). I thought I might try to find those books today, especially since I have the power of the Internet at my fingertips. But alas, I have misplaced the list again, and will have to search for it. I would like to add that I am not a believer in the supernatural. But I'm also not a disbeliever. A few strange things have happened to me in my life, things which I can't readily explain, but none of them were so odd that I couldn't imagine some natural reason behind them. The little tale I've told above is all true as I recall it, but I'm not sure it bordered on the supernatural. Perhaps I was overly tired. Perhaps my memory is incorrect. Perhaps there was just a series of misunderstandings. But sometimes, every once in a while when I think about that little situation, I can't help but feel that something was giving me a warning, something was saying, "Stay away." Whatever the matter, I'm glad I didn't go through that basement door. Notes: After my latest zombie read left me wanting more, I decided I'd go back to what I consider not only the best zombie book ever written, but one of my personal favorite books. And no, I've not seen the movie. I'll probably get around to it eventually, but apparently it has very little to do with the book other than the title and the fact it's about zombies. I first read World War Z about eight years ago soon after it was first published, and I loved it so much that I've been somewhat afraid of re-reading it since then because I fear I might not enjoy it so much on second read. But that is a chance I'll now take. Mini review: Still a damn fine book, and still a personal favorite. On a second reading, it's just a touch monotonous, not just because I'd read it before, but because the way the book is structured is much more obvious to me. Maybe I noticed that apparent structure because I'd read the book before, or maybe it's because I'm a more experienced writer now. Either way, this is still a book worth reading by anyone. You don't have to be a zombie or horror fan to appreciate this book, because it is so much more than that, it transcends genre in a lot of ways. 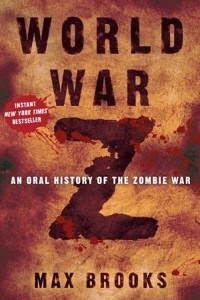 Basically, this book is a collection of stories from the survivors of the great "Zombie War." 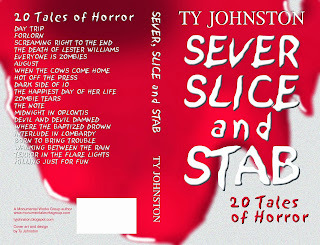 And these aren't gore-filled horror tales. These are personal tellings, fictional accounts not that dissimilar to those of World War II veterans and the like. In the end, this is a book about hope, though the price paid is quite high, and literally everyone on the planet pays that price. This year I've not been doing a lot of self publishing, just a 5-part serial earlier this year. Last year I produced a total of about 600,000 words. This year I'll be lucky if I break 100,000 words. Stuff happens, life intrudes, in this case mostly health-related stuff, bad stuff. Things seem to have settled down a little bit, so I've been able to get a little work done of late. However, most of what I've been working on are not materials to be self published, which means it will likely be some time before they see the light of day. I've a handful of short stories out for various anthologies, and here and there I'm working on a larger secret project which I don't want to reveal just yet as I'm not the only person involved with it. I sought out none of these projects. They were offered to me or my name was suggested by someone else, and I gladly jumped on them. Thankfully those I've been working with are understanding folks, because I've let the ball drop a lot this year when it comes to writing ... family has to come first sometimes, like it or not. Some of these projects fill me with a great amount of pride. Mainly I'm proud because others thought of me when the projects came along. I like that, and I definitely appreciate it. It's even got to the point where I've had to turn down quite a few anthology offers this year. This also makes me feel a little pride, editors and publishers asking me if I'm interested instead of me having to send out yet another query letter or submission to someone who doesn't know my name. I wish I'd had the time to take part in all those wonderful projects. Truly. If not for my serious family health issues this year, I probably would have taken part in all those wonderful projects. Self publishing is fine, it pays the bills after all, but there is a part of me that enjoys working with others. And there's a part of me that misses the old days of submitting stories. Yes, you read that correctly. I actually miss that stuff. Don't get me wrong. I don't want to go back the days of blind submissions being my only option as a writer. Because then it wouldn't be an option. No, I like the fact I can write what I want, when I want, how I want, where I want, and then I can do with it whatever I damn well please. I don't have to write to a market, or to a particular editor's taste. But I kind of do, even when self publishing. See, I write for a living, which means I still have to write to a market. And though I don't have to please a particular editor or publisher, I still have readers (some ... okay, both you guys reading this). If I want to continue making my living as a writer, to some extent or other I have to publish material that is at least somewhat pleasing to the audiences I am trying to reach. So far it's working decently, but because of my lack of publishing this year, things have fallen behind with my writing and even financially. Then there are all the health bills, and my own health, which is not so good most days (sometimes I can't even write a hundred words, but lately I've been doing better). Anyway, enough of the sob story. What I really wanted to talk about today is submissions. I didn't think much about submissions until the last few days when I heard of several anthologies which sounded interesting to me, and there are a handful of magazines and online sites I follow to which I'd like to submit. But I've other projects at the moment, and not been able to write much this year, and I'd really like to self publish at least one novel before the year is finished. Hell, come January it will have been two years since I've published a Kron Darkbow novel. Two years. 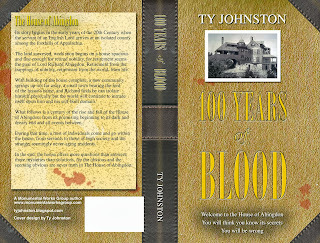 I couldn't hardly believe it until a fan contacted me recently and asked when the next Kron novel would be out. It's true I've published several works in the Ursian Chronicles, the same world in which Kron exists, but I've not published any Kron-centric stories or novels. So, here are my plans for the rest of the year, if the health situation remains somewhat steady: I want to finish up that secret project I mentioned, which I hope to do in the next month or so. Then I'm thinking of penning and submitting three or four stories to various magazines and online sites. That will probably take me another month, give or take. After that, I'm going to start my next Kron Darkbow novel, to be titled The Company of Seven. My estimate is the novel will be about 100,000 words, and my goal is to have it ready for publishing by Christmas of this year. That's a lot of writing to do in just a few months. I've done it before. In fact, I did it last year, and probably the year before. But my health was better then. Now I'll be pushing it. And I'm not going to rush myself. If my health fails again, or if I get worse, then I'll be doing nobody any good if my writing slows even further, or if I get to the point in which I cannot write at all. I'm shooting for Christmas for the Kron novel. If it doesn't make it, it doesn't make it. It'll come out in January or February, or whenever I can get it written and beta read and edited and designed, etc. I might opt to start the novel before working on those stories for submission, but I'll see how things go and how I feel when I get to that point. Regardless of all the stuff going on in my life and with my writing ... I still kinda miss submissions. As infuriating as it can be, it's still a little fun to roll the dice, to spin the wheel, to lay your cards on the table.